The 1st international chess tournament “Negroponte 2010″ was played from 9th to 17th August, 2010, at the beautiful city of Chalkis, Greece. The tournament was managed by the Chess Academy Chalkis “Palamedes Evia”, and played as 9-round Swiss Open with total prize fund of 25.000 EUR. The first prize is 3.500 EUR, and there were special awards for women, juniors, rating performance, etc. 204 people from 29 countries competed. GM Suat Atalik was unstoppable, scored seven victories and conceded only two draws, for a total of impressive 8.0 points from nine games in such a strong field with more than 30 Grandmasters. In the last round he defeated the top-seeded GM Denis Khismatullin with black pieces. 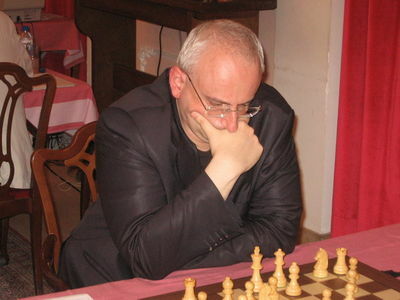 Atalik recently returned to tournament arena after a two-year hiatus and a court case against the Turkish Chess Federation, which he won. American GM Robert Hess bounced back after a loss to Atalik and with a string of victories collected 7.5 points to reach a clear second place.